We've got a pretty long wait until Shadowhunters hits our screens. Fortunately, our on-set reporters have cameras, and a thirst for Shadowhunters exclusives. Thanks to McG, we even get a glimpse of the Shadow World in this editing suite special. McG has been taking us behind the scenes and into the Shadowhunters editing suite to give us a sneak peek of our favorite characters being brought to life. The High Warlock of Brooklyn with glittery eyes and a cloud of magical mauve. Bonus! A glimpse of McG himself. Plus, the eyes! Magnus Bane! We went crazy over this photo: big team crush on Harry Shum, Jr.
And here is an exclusive behind-the-scenes photo from the actual shoot. 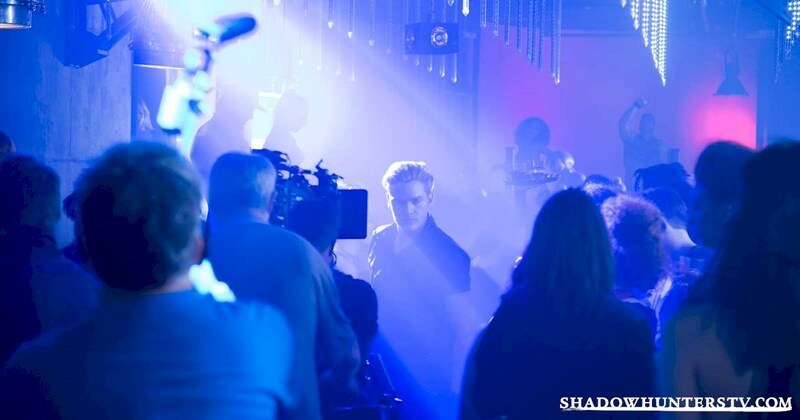 McG also began to edit Jace taking on Pandemonium. So, we went and found this exclusive photo of him wading through the crowd. Then we all burst into tears. And here's a little video because we just can't get enough of our favorite parabatai duo! What do you think of what we have seen in the editing suite so far? Let us know in the comments below!